"Maybe you could be a mayor or a senator or a Supreme Court justice -- but you might not know that until you join student government or the debate team." 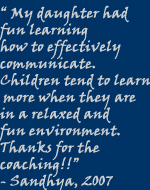 Smart Kids and Parents realize the importance of good communications skills. If you aspire to rise above the rest and be a leader - strive to improve your communication skills and public speaking abilities today! 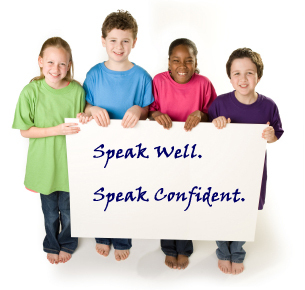 Speak Well and Speak Confident with Speakbright's programs. Note: These programs are offered in the Bay Area, California (USA) area only. » Speech structure and Preparation. » Controlling pauses and fillers (ahs and umhs). » Basic principles of a formal debate - Points to consider on how you are judged. 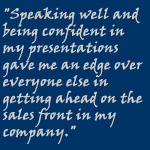 » Using gestures and body language - How best to use them effectively in your speech. » The effectiveness of tone, volume, variety in voice during a speech. SPEAKBRIGHT has comprehensive courses for all ages. Speakbright's programs cover classes for adults which include speaking confidently, making effective presentations and special sessions on interview preparation. Special classes are available for the stay at home moms and part time workers looking to enter the job market. High school students can benefit from this program by developing their presentation skills which helps them prepare for the college interviews and the work life that beckons them later on. 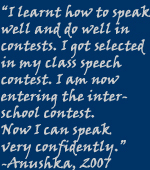 Many children find the prospect of speaking in front of a group of people to be quite nerve-wracking. It has even been suggested that the reason why so many adults have a fear of public speaking is because they never learned how to feel comfortable in front of a crowd as children. Our Comprehensive courses can help! "Communication is a skill just like any activity that you pursue - be it swimming or dancing. Unless you are in the water you cannot learn to swim, unless you practice you cannot be a great dancer. Practice good communications skills and learn with a group - it can never be achieved solely by reading books - you have to practice and use it everyday to be a perfect communicator." A new & exciting Career Discovery Program for Teens.